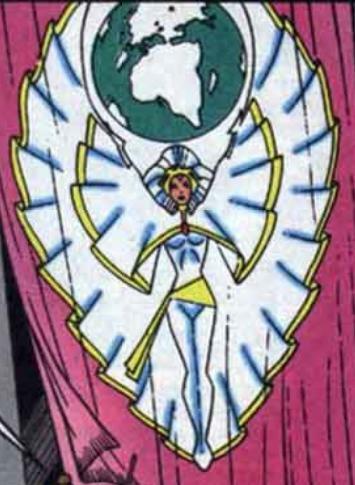 Powers: She possesses the same powers as storm but thanks to the added boost of the Pheonix she has absolute control over the weather on a global scale. In an Alternate time as the X-men fled a space station Jean Grey was knocked unconscious. (This event if Jean were conscious would have led to her becoming the Pheonix) instead Storm flew the shuttle and was replaced by the Pheonix instead. In the resulting crash only “Storm” and Wolverine survive. As Stormpheonix she decides to create world peace as a “benevolent ruler”. All who opposed her she froze and suspended in the atmosphere, she took over the shield hellicarier which became her base of operations. All who wished to be saved were reduced to pubescence as she became their “mother”. Over time she grows detached from human society and so those who oppose her seek out the original wreckage from which she walked. Their they find the real Storm who is comatose. Kitty fuses into the real Storm’s body to confront StormPheonix who upon realizing she isn’t really Storm, she flees earth after which infighting immediately begins over the new direction life should take.